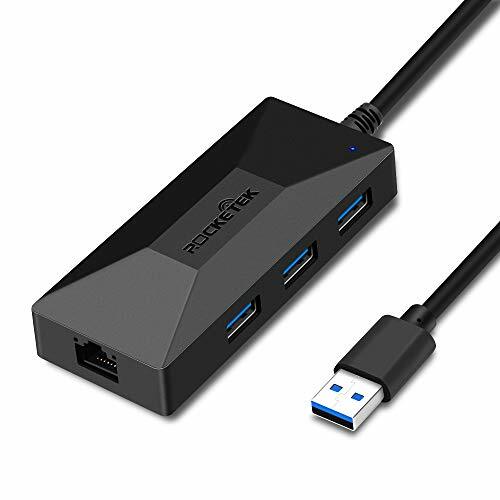 Rocketek Multi USB 3.0 Hub with RJ-45 Ethernet Adapter LAN Connector Thunderbolt cable, easily expands one USB port into four, perfectly suitable for your MacBook MacBook Air, Mac Mini, Microsoft Surface, Ultrabooks and more. Rocketek USB 3.0 Hub helps you to connect up to 3 USB devices to your PC or Laptop, such as external hard drives,USB flash drives,mouse,keyboard,and much more USB devices etc. Connect to the 1 gigabit ethernet port and give access to superfast network speeds at 1000Mbps; backward compatible with 10/100Mbps. Faster and more reliable than most wireless connections. The handy and compact design offers an ideal way to fast access to your USB devices anywhere, with a 30cm cable. 1. For a stable connection, please plug extra power adapter(NOT INCLUDED IN PACKAGE) for power for high power-consumption devices. 2. Please download driver on ROCKETEK Website for Windows 8/ 7/ Vista / XP. Perfect Extension: Rocketek 4-in-1 Hub expands one computer port into four--3 USB 3.0 superspeed ports and 1 RJ45 gigabit ethernet port. High-Speed USB3.0 interface: Sync data at blazing speeds up to 5Gbps, suitable for keyboard, mouse, USB flash driver, hard disk and etc. RJ-45 Gigabit Ethernet Port: The Thunderbolt cable gives you access to superfast network speeds; automatically adapts to 10M/100M/1000Mbps network transmission. Slim & Safe: Extremely compact design makes it easily portable and saves desktop space, Built-in surge protection keeps your devices and data safe and supports hot swapping. What you get: Purchasing Rocketek 4-in-1 USB3.0 Hub enjoy 18-month warranty and whole life technology support.